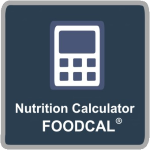 Remember: Remember: Nutrition Calculator FOODCAL doesn't require any fragile data or SMS confirmation. Registering is free of charges. More information about security you will find here: Privacy i Terms and conditions.